Bogart could have shot himself. That would have been a twist in the story. Joke all you want, but Bogart’s chin is to die for. Figuratively speaking, that is. I’m sorry, but I just think they all look like washed out wimps, I get absolutely zilch menace from this photo. Still, your writing is always well received in this little spot down under. Think Bette could probably melt it with the look of bored disdain on her face. This film…. When I saw it for the first time I was shocked at how beautiful Bogey was! Agreed, but ugly people can be hot too. Bogey was always hot, but when he was young, he was beautiful. In comparison Leslie Howard is a pretty boy. I know! When George Clooney was going to be in O Brother, Where Art Thou, he sent his script to his uncle on Kentucky. George was born there but moved when he was young. 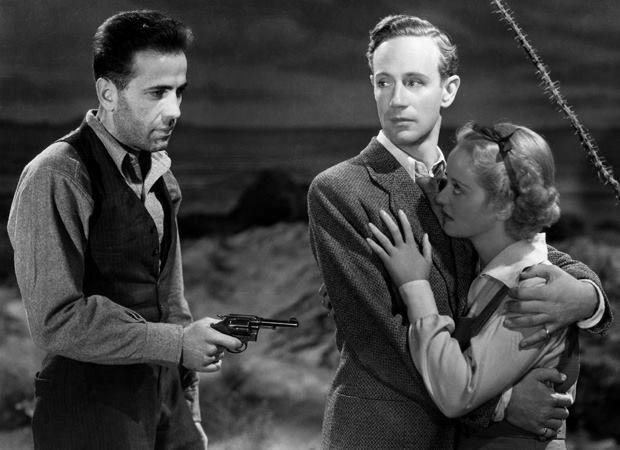 Leslie is thinking “how do I get away from that thorny branch that has somehow made its way into the scene?” The twist should have been that Bogie’s gun was actually Spencer Tracy’s liquorice one from Adam’s Rib. Obviously Leslie and Bogart should have walked off the set hand in hand. Now that would have rocked movie theaters across the nation. Aren’t they at sea? Not only in the PLOT, but literally? Bette clearly is confused about Mr. Howard, clutching at him in a purely girlish way, which might be why she won the Oscar. She could ACT (although seeing her recently in an old movie – one of Agatha Christie’s “Marple” movies..she must have been somewhere around a thousand years old at that point, made me realize that strokes triumph over the most iron willed). Now that film sir, might make a smashing Past Imperfect… (Murder With Mirrors – Helen Hayes..ect). Back to our stormy sea and plastic gun and Bogey channeling backward Ben Affleck in any of his recent films where that unshaven bad boy thing is his style… where was I? Oh who the hell knows? Great post as usual sir, I laughed hysterically. You put such a fine point on the dialogue! Does the FILM have to be black and white? The photo is no problem, but if technicolor films are taboo…well yeah. I do understand. Since this Marple was somewhere in the 70s, nobody much that acted IN it is still alive anyway…? Love those classics – ” The Good, The Bad, and The Bigly “.